TIRA has developed a new leadthrough for the operation of shakers with climatic chambers. This leadthrough allows in comparison to the previous systems with headextender and massive thermobarrier plate a significant better isolation at high temperature differences. This way an operation of sensitive climate with higher dew points is better possible. Therefore more constant temperature conditions for the test material are present. The condensation of humidity out of the testing air is reduced considerably. At cooling operation of the chamber the shaker inside is better protected against condensation. The new model offers in addition to the significantly enhanced isolation attributes also a weight advantage of about 30%. 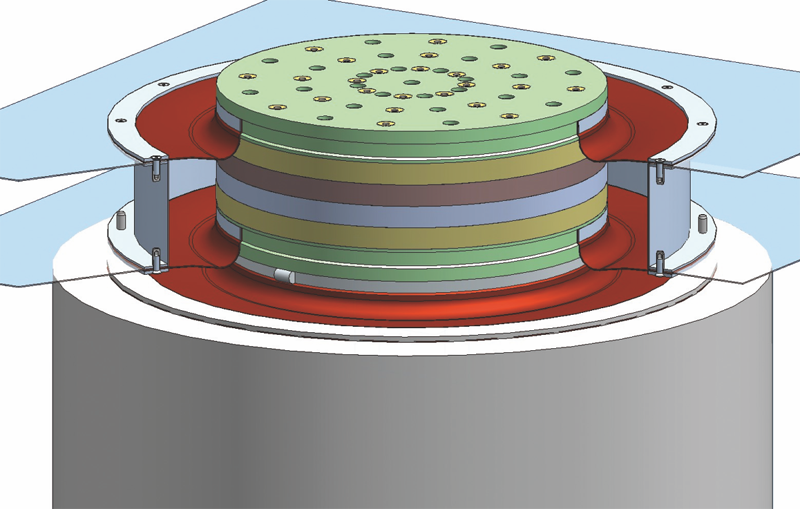 Headextenders are used for combined test sequences in connection with climatic chambers. They are manufactured of magnesium and enable in combination with thermobarriers the operation in a temperature range of -40 °C to 140 °C. Thermobarriers serve as isolation between climatic chamber and clamping surface at temperature differences. TIRA offers thermobarriers in circular and square versions for shaker armatures, head expanders and slip tables.